We’ve returned to Firefly HQ after what was a wonderful trip to Harrogate for the College of Podiatry Annual Conference 2015. At the event we launched SOLS, the 3D printed orthoses. SOLS’ next generation technology is changing how Podiatrists prescribe orthotic devices. 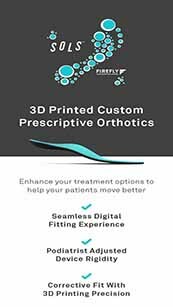 Firefly used the Conference as a platform from which to allow Podiatrists experience first-hand the process of prescribing SOLS orthotic devices using Apple’s IOS technology. In the weeks leading up to Conference, we let our customers know of our intention to launch SOLS and in doing so, SOLS was received excellently among the conference delegates. 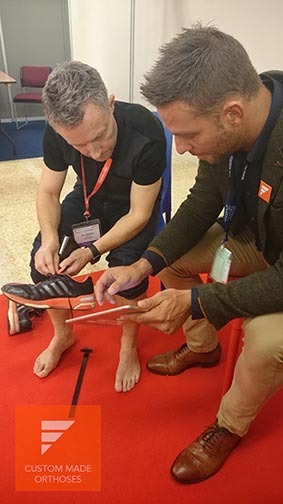 Across the duration of the event, Firefly introduced SOLS to hundreds of Podiatrists and gave 60 conference delegates their own complementary pair of SOLS to trial. Richard Ranky, SOLS Senior Biomechanics Engineer, flew in from New York and was on-hand to answer delegate’s queries regarding any technical aspects of the design and manufacture of the product. SOLS takes advantage of the functionality and user experience Apple’s software and hardware is renowned for, as the prescription process is fulfilled using an iPad or iPhone. 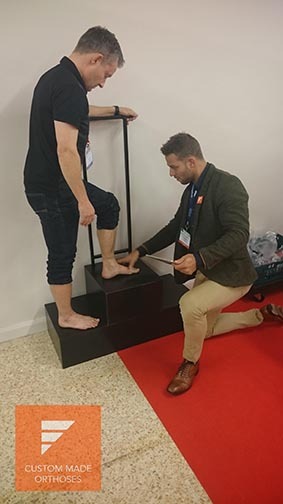 Ian Lenehan from Total Podiatry, Kent was one of the many Podiatrists who availed of the chance to get a complementary pair of SOLS and trial the product. 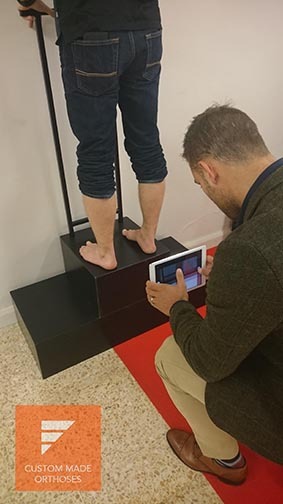 Ian features in the photos below along with Firefly’s Greg Gillanders, going through the process of prescribing SOLS orthoses. SOLS have two versions of their orthotic products: SOLS Rx and SOLS Flex. SOLS Rx are only attained when prescribed by a Podiatrist and allow for the devices to take additions and modifications to enable the clinician treat the patient’s condition. While SOLS Flex is a mass consumer orthotic device, designed to offer comfort while relieving fatigue. As Firefly are the exclusive distributor of SOLS Rx for the UK and Ireland we are your point of contact to find out more about how you can use SOLS in your clinic. If you wish to find out more, contact us via email, info@firefly.ie and ask for more information about SOLS.